Prabhanjanachar | Hari Sarvothama! Vayu Jeevothama! Today is the most auspicious Ekadasi dina. This vratha is the holiest and very important among all vrathas and a MUST DO for all between 8 and 80 years. 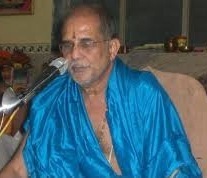 Please listen to a brief speech on Ekadasi Mahatme by Sri Vysasanakere Prabhanjanacharya. 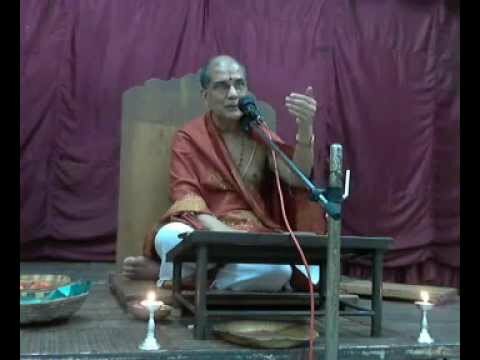 On this auspicious Sri Rama Navami day, let us listen to “Sangraha Ramayana” Pravachana by Sri Vyasanakare Prabhanjanacharya. Today is the most auspicious Ekadasi dina. This vratha is the holiest and very important among all vrathas and a MUST DO for all between 8 and 80 years. Please listen to a brief speech on Ekadasi Mahatmya by Sri Vysasanakare Prabhanjanacharya. Today is the most auspicious Ekadasi dina. This vratha is the holiest and very important among all vrathas and a MUST DO for all between 8 and 80 years. Please listen to a brief speech on Ekadasi Mahatme by Sri Vysasanakare Prabhanjanacharya. The Auspicious Chaturmasa Vratha is on and we are currently in second month. 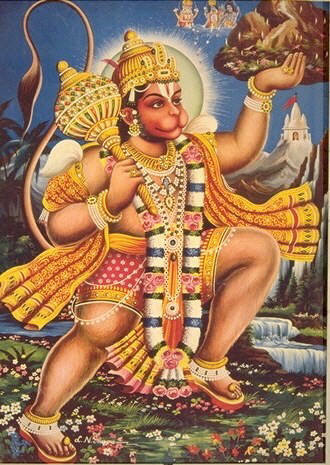 Next 3 days are very important with Sri Rayara Aradhane and next is Sri Gokulashtami habba. 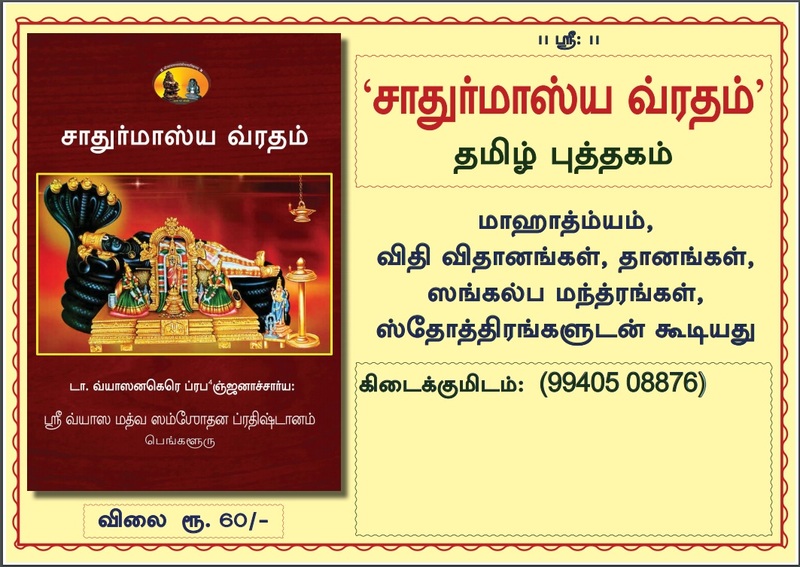 As we are all set, here comes one good news – A new book in Tamil is released for the benefit of the devotees and this is a Tamil Translation of the Kannada book published by Dr. Sri Vyasanakare Prabhanjanacharya. The Tamil translation of this must have book is done by Smt. G K Chandrika. This book includes Sankalpa Mantra, Masa Mahatmyam, Vidhi, Daana details & relevant Stotras as well. We are indeed thankful to the author and publishers for making this Tamil version available to us at the right time and it will be very useful to us in our anushtaana during the next four months. Price: Rs. 60 /- only. For your copies and more details, please contact at this Phone Number: 9952076341. Dr. V Prabhanjanachar has given one pravachana on Hari Vayustuthi recently and this was uploaded by Livepravachana in YouTube. 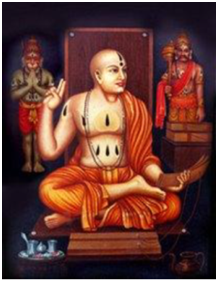 Please listen to this lecture, wherein Achar discusses in detail the greatness of Sri Trivikrama Pandithacharya and the great moments leading to this mantra composition and Sri Acharyaru has also given the stamp of approval by prefixing the famous Nagasthuthi to it. The very auspicious Adhika Ashada Masa is on and special pooja, pravachana and parayana are happening everywhere. Now devotees in Chennai are fortunate as Vidwan Dr. Sri Vyasanakare Prabhanjanacharya will be giving Pravachana on “SUNDARA KANDA” @ Nanganallur. It is indeed a great opportunity for us and request all to kindly attend the pravachana and get the blessings of Sri Hari Vayu Gurugalu.